The Swivel Sweeper G2 is the new and improved version of the original top selling Swivel Sweeper. This new and improved floor and carpet sweeper lets you clean dirt and messes faster and easier than ordinary cordless sweepers. It combines the cleaning power of Quad Brush Technology – four sides of powerful rotating brushes along with a 360 degree swivel feature to easily maneuver around furniture and other objects. It is powered by a Snap-N-Go 7.2v rechargeable battery that gives you 45 minutes of continuous cleaning. Plus the entire unit weighs only 2 lbs. The super sliders allows the Swivel Sweeper G2 to easily glide across any surface for effortless cleaning. The new features of Swivel Sweeper G2 includes a back saver elbow joint. The poles bends to clean hard to reach places so you don’t have to. There is now also a touch-less dirt tray. All you have to do is just press the tabs over a trash can or garbage bin to empty it. It couldn’t be easier. Plus with the magnetic storage latch, you can fold up the Swivel Sweeper G2 and it’ll take less space to store than a broom. Right now with this special buy 1 get 1 free offer, you can get 2 Swivel Sweeper G2′s along with 2 Free Mini Sweepers for just 2 payments of $19.99 plus the cost of shipping and handling. A free upgrade to rush shipping is included. 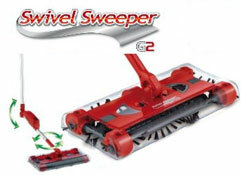 30 Comments on "Swivel Sweeper G2"
Any tried this new version yet? I bought the original Swivel Sweeper from one of those As Seen on TV stores and it works pretty well. Very light weight. I was going to buy another one but then saw this new version is available from an infomercial. I WANT TO KNOW IF THE CHARGER OF THE BATTERY CAN ADOPT VOLTAGE OF 220 VOLTS IN INDIA OR NOT. I’ve seen the original Swivel Sweeper sold online in India before so I would have to assume it would work. However, I’m not sure if this newer version is available in India yet. would like to order product but unable to enter state information. is it not available for Hawaii customers? Please respond. Also tried calling phone number on tv promo but line was constantly busy. Thank you. It looks like there is an error on the order page. It should be fixed now and available to people in Hawaii and also Alaska for an additional $3.99 in shipping and handling. How long does the battery last for? The big complaint I see about the previous version is that the battery konks out from 2 months to 1 year. How long the battery lasts will depend on usage. However, the instructions state that you don’t have to constantly keep the battery plugged into the charger once it is fully charged. By keeping it plugged in over 24 hours after the battery is fully charged, you will shorten the life span of the battery. I ordered the G2 about a week ago and I am wondering when it will be delivered? I saw on one sight that they have office in NJ.Does any one know if it can be picked up from office & save the freight. can anyone tell where it is available in singapore.willing to buy the sweeper g2.can u tell wether it is efficient. Just wondering how much the shipping and handling would be to Canada. I have ordered things online before and the charges for shipping are usually twice as much as the item itself. The Swivel Sweeper is a great product. Thank you for the post. how dose it do on pet hair? dose it get cloged or do the brushes get cloged with hair? Can replacement batteries be ordered? My aunt has lost hers somehow. Its works well for picking you pet hair and human hair. If the hair gets stuck, it can easily be removed with the included tool. Can I purchase one G2 Swivel Sweeper rather than two? Thank you. Yes you can just buy 1 Swivel Sweeper G2. I need to order one where can I get one 220v ? I would like to order the G2 but i live in Mauritius in the Indian Ocean. How do i proceed? Please let me know. where to buy in Singapore. nice sweeper but the battery does not last…getting another is $13.00..to much for a replacement..especially thaT IT NOT LAST VERY LONG..
Want to make sure I understand this offer… is it 2 payments of 19.99 PLUS 2 shipping charges of 14.99? I oredered the 2-for 1 and get free mini machines and the phone recording did not give me my total cost of this order. I would like to know this so I can update my check book. I ordered the 2 for 1 promo from the TV ad. The automated system (way too long and annoying) said I would receive an order confirmation via email. I have not gotten one. How do I know my order was even processed? The battery is definitely the weak link. I love the machine, but would be so much better if it ran on D-cells. The smart recharger is a good idea but can’t find one now. I have more invested in batteries than I paid for the machine. Does it come with any type of charger? I saw where you can buy a super charger separately. I received the swivel sweeper for Christmas. I find that it does not do the things that is advertised. Even after it has a full charge, it fails to pick up stuff on my kitchen floor and or my carpet. I get small oak leaves that blow into the house and it will not pick them up. I dropped a little dry soil on the floor while repotting a house plant, it failed to pick any of it up. I have cleaned it out after each use, even making sure that the brushes are clean….any suggestions?? ?